Fresh vegetables of choice to equal about 3/4 cup: chopped peppers, sliced mushrooms, sliced zucchini, chopped tomatoes. Preheat Presto® Electric Griddle at 275°. Brush 1 tablespoon of oil on half of griddle surface. Add onion and vegetables of choice to oiled side of griddle; sauté for 4 to 5 minutes or until vegetables are crisp tender. Brush on 1 tablespoon of oil to the other half of the griddle surface. While pouring about 3/4 cup of eggs on oiled surface move a spatula across the griddle surface to form eggs to a symmetrical shape. Cook until the edge of the omelet is set and top surface is only slightly wet. Add 3 to 4 spinach leaves to the center of the omelet. Top with onion and about 1/4 cup sautéed vegetables. Using a spatula lift the edge on one side of the omelet and fold to the center of the omelet. Repeat on the other side of the omelet. 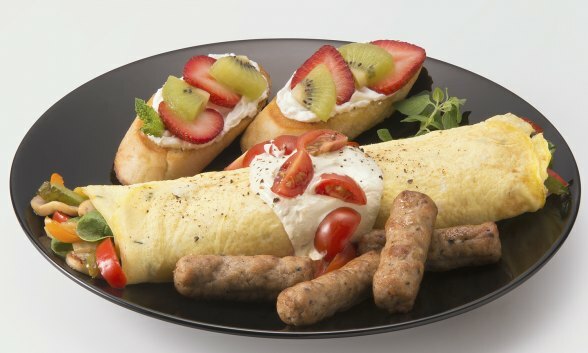 Gently roll the omelet on the other side and allow to cook for another minute. Top with cheese and serve. Click here for more information on our line of quality Presto® Electric Griddles.